JM4 Tactical changes the status-quo again, by using both Boltron and leather in their new RELIC holster. 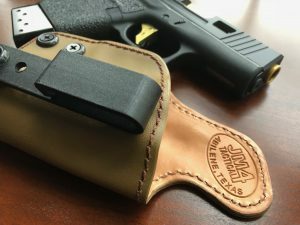 JM4 Tactical is a Texas-based company that broke out a few years ago when they released their Quick Click and Carry (QCC). The QCC was innovative in that it used magnetic retention. That holster had become so popular that the company released a few different versions to meet individual requests. But enough of the past, what about their new RELIC holster? RELIC is an acronym that stands for Reliable, Easy, Light, Individual, Carry holster. 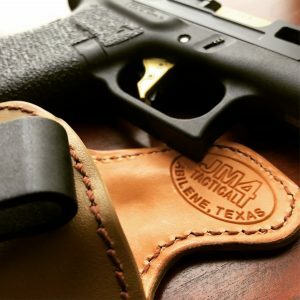 JM4 holsters are known for their quality craftsmanship and materials. And this holster is no different. The new RELIC is made with a shell of Boltron to create rigidity and structure, and a lining of high-quality, Herman Oak leather to protect your firearm. 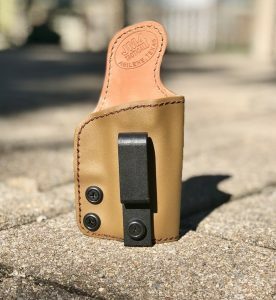 The materials used to give you the custom shape of well-known Kydex holsters, but because it is lined with leather, it is kind to the finish of the gun. Leather and Kydex are tremendously popular holster materials. Both materials have some benefits and drawbacks. Kydex is very durable, inexpensive and easy to form to the gun. But, Kydex can warp, or become brittle and crack in extreme temperatures. Leather is soft and doesn't damage the gun, but it is heavier, thicker more expensive and more difficult to turn into a holster. I know what Kydex is, but what about Boltron? Owner Chad Myers explained that the decision to use Boltron instead of Kydex was deliberate because he liked that Boltron was not affected by extreme temperatures like Kydex. Additionally, the Boltron used is produced in Michigan. As a Marine Corps Veteran, Chad said it is important to him that his company only use materials sourced here in the United States, rather than Kydex from China. Okay, so Boltron has a cool name and is a super durable material. So why not stop there? Why the leather liner? The benefit of adding a liner of leather to a hard holster has been realized for a while. Repeated drawing, holstering, and everyday use of a Kydex/injection molded holster can wear the finish on your firearm. Leather simply doesn't have this problem, so it makes sense to have combined both materials. The problem is, most companies glue the leather liner to the inside of the holster. Over time, the leather will separate from the shell, not good. From what Chad could tell me about their patent pending process they not only glue the leather but also stitch it to the Boltron. Not only does this keep the leather in place, but it looks amazing! The stitching combined with the unique texture of Boltron gives the holster a killer look. The RELIC has a unique look. Besides being gentle on your gun's finish, having a leather liner makes drawing the gun silent. No audible pop that draws attention to the fact that you are about to 10 ring the bad guy. I know some people like the click they get when reholstering into a Kydex holster. You don't get that same crisp click with the RELIC, but because the it's formed to the shape of the gun, you can still feel when the gun is firmly seated. It sort of ‘locks' into place, just like a custom leather holster. 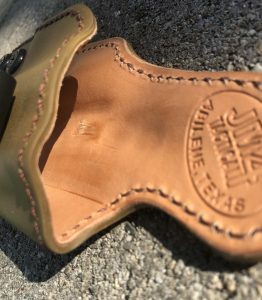 JM4 uses grade A, top quality Herman Oak leather from here in the USA to line the holster. So they didn't skimp on the quality of the liner. Remember back in the 70's when Ricardo Montalban endorsed the Chrysler Cordoba's ‘soft Corinthian leather'? Maybe I am dating myself, but that's okay because the point is that it feels luxurious. I evaluated the tuckable version which uses a single injection molded clip. The clip, which has three adjustment holes, uses a single attachment point toward the bottom of the holster. The three holes in the clip allow for ride height to be adjusted. I find the single clip to be good, and bad. The RELIC weighs in at 3.5oz, which is only slightly heavier than an all Kydex holster. The single point, mounted low on the holster means you can tuck your shirt in between the holster and your pants, as well as adjust your angle of cant. Allowing the angle to be adjusted means you can carry it on different locations on your waistband, and get the right draw stroke. Ideally, this holster works with strongside hip or small of back carry. JM4 Tactical includes Loctite for the screws once you get the holster set up to your liking. It is not just a ‘nice to have' accessory, I think it should come with every holster sold. This way you won't lose any of your screws or have your holster fall apart. Again, I evaluated the tuckable version for a Glock 43. I typically carry in the appendix position (AIWB) and while you can use this model for AIWB, it is not as ideal as their holster specifically for appendix carry would be. Instead, I used the holster in the 3 o'clock and 6 o'clock positions. The holster is much more suited for this position of carrying. It concealed very well and was just as comfortable as any other hard-sided holster. As you might have guessed, the RELIC is slightly heavier than an all Kydex holster. It weighed 3.5oz and my all-Kydex Tulster holster weighed 2.6oz. 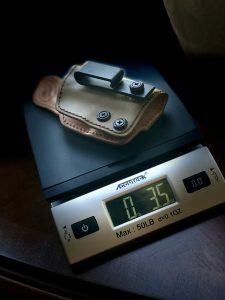 Surprisingly both holsters measured 1.3″ at their widest point, which surprised me. The holster has a sweat guard, which generally speaking I am not a huge fan of. However, the sweat guard is rounded which helps with comfort. 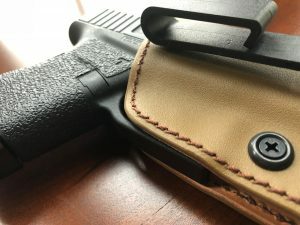 The holster protects the trigger completely, without including excess material that would hinder establishing a good grip on the gun while it is still in the holster. The trigger is covered well, but without using excess material that would hinder your grip. Like all my holster reviews, I use the holster for at least 30 days before starting my review. The RELIC is no worse for the wear and is holding up just fine. I especially focused on the leather around the mouth of the holster that is more prone to wear from holstering. Sure the soft leather shows some wear from drawing and holstering, but what leather holster doesn't? A final note is that my Glock 43's slide is Cerakoted. So far the leather liner on this RELIC holster has not impacted the Cerakote finish on my Glock, which may be important to those with custom painted guns. The leather does show some wear from drawing and holstering the gun. This is not unusual for a leather holster. I mentioned that the RELIC is the Cadillac of holsters. I make this analogy because the quality of materials and workmanship are evident when you get it in your hand. The holster is going to come with a price to match at around $95 dollars. It is more expensive than your basic holsters but not much more than many custom Kydex shops. Compared to an all leather holster, it's around the same price if not cheaper. In my opinion, JM4 Tactical again raises the bar with an innovative design. Check out the new RELIC design on their webpage.